Bosch Ulwazi marks its tenth anniversary this year, with a track record in the advancement of engineering skills across South Africa. The company was established in 2009 as a subsidiary of Bosch Holdings in order to mentor engineers and project managers to achieve professional registration with regulatory bodies. 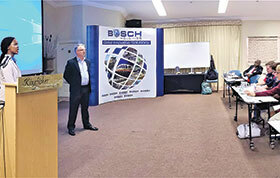 Today Bosch Ulwazi provides a range of technical skill solutions to public and corporate organisations that employ graduate engineers, technologists and project managers who are candidates for professional registration. Professional registration is a key milestone that prepares young graduates for leadership, or even branching out into their own enterprise. To date, Bosch Ulwazi has developed 78 emerging enterprises in South Africa, which are now profitable and sustainable. Another key focus is graduate development. The company’s Engineer-in-Training (EIT) and project management program provides opportunities for graduate engineers and project managers to enhance their practical engineering and project management competencies, to meet the requirements of ECSA and SACPCMP for professional registration. Since the introduction of the EIT programme in 2010, graduates have worked on projects in South Africa, Brazil, India, Barbados, Tanzania, Swaziland, China, Oman and Kenya. On completion of the curriculum, candidates have a comprehensive portfolio of evidence that assists in their submission for professional status. To date, 15 graduates have successfully registered as professional technicians, technologists and engineers. Bosch Ulwazi has also assisted 10 senior engineers to complete their registrations as mature applicants with ECSA for professional status.